Here’s a Chinese themed game with a twist. For anyone familiar with Chinese domestic policy there is a strict law in place to curb over population where you are only allowed to have one child. However, if you have twins it’s considered a lucky omen. Lucky Twins is based around this very concept and is a beautifully animated online 5 reel where you can win some significant oriental cash rewards. Based in the Isle of Man, and being heralded as the creator of the world’s first true Online Casino in 1994, Microgaming has been the platform upon which many titles have been developed. They have created more than 850 unique casino games, including over 1,200 variants. Publishing a mix of licensed and proprietary content, the intention of this developer is to keep their portfolio fresh by releasing new titles every month. Having won a number of awards, such as Mobile gaming software 2017 at the EGR awards, as well as ‘Innovation in RNG (Random Number Generator) Casino Software in 2013, this developer clearly demonstrates what it takes to be a pioneer within the online gaming industry. 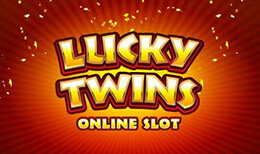 Lucky Twins plays off of a theme that is widely seen within the online slot gaming world – the concept of Chinese luck. The well-known aesthetic has been used before to suggest luck and prosperity, and Lucky Twins is no different. If anything, this game is one of the stronger additions to the market recently. Demonstrating a simplistic, yet eye popping aesthetic, you find yourself rooting for the symbols that can appear – making yourself feel even luckier when you win and see the bags of money, lucky cats and golden fans. The sound effects fit very well with what you’d expect in a game like this; it is not too distracting, so you can focus on the easy-to-use controls for your first few spins. It does an incredible job of convincing you that you are inside a casino, with the easy to drown out background hum of machines and people talking non-distinctly. Even the symbols give off this vibe; the stylised special symbols are combined with the stereotypical casino symbols to ultimately tie the whole aesthetic together. This five by three, nine pay line game functions fairly simply, and is not a complete game changer in the industry, but it serves its purpose for low and high rollers alike. With a minimum bet of 0.01, and a maximum of 45 total (5.00 across all lines) it is simple to see why people play this game. The non-intrusive atmosphere means you can relax while playing this – especially when not a lot is on the line. As usual, we see the special symbols of the Wild and the Scatter. With the former, this symbol can be substituted for all others on the board (bar the Scatter). When you see this symbol over your reel, it may be time to celebrate! This highlights the importance of the oriental belief that good luck comes in pairs – the art style is that of a boy and a girl holding a plate of prizes for you! The Scatter multiplies your winnings if there are more than three of them on the board. With a few neat features, like win history, and a ‘top wins’ of the session, Lucky Twins functions very similarly to other games on the market, but without any particularly special features. Play this if you are in the mood for a game that you will let run for a while, and not be actively involved in. Want to try another Slot Game? Read more and play Mystic Dreams.